Do you have an aspiring tween or teen inventor in your home? Want to encourage a career in science, technology, engineering or math? 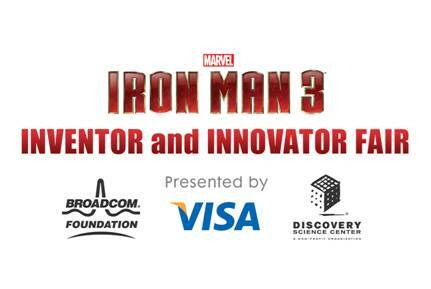 In preparation for the release of Iron Man 3, Disney, Discovery Science Center, Broadcom Foundation, Marvel Studios, Visa Signature and the famous El Capital Theatre in Hollywood have teamed up to sponsor a nationwide Marvel’s Iron Man 2: Inventor and Innovator Fair. The competition is open to students in grades sixth through ninth. Tweens and teens are being asked to produce innovative and inventive projects based on themes from the movie – science, technology, engineering and math (STEM) concepts and practices. Among the possible topics that projects can relate to are: Develop Carbon Sequestration Methods, Engineer Better Medicines, Secure Cyberspace, Engineer the Tools of Scientific Discovery – wow! The top 12 finalists will win a trip to Southern California, a behind-the-scenes tour of the Disney Studios, a meeting with the Disney Imagineers, a trip to Disneyland, a visit to the Discovery Science Center AND their projects will be displayed at the El Capitan Theatre in Hollywood, CA. The grand prize winner will receive a special award during a ceremony prior to the showing of Iron Man 3. Iron Man 3 will be available in theaters starting May 3rd. This entry was posted in Teaching & Education Tips, Technology and tagged Iron Man 3, movies, STEM, teens, Tweens. Bookmark the permalink.